WASHINGTON (Sept. 10, 2013) -- To eliminate sexual assault in the Army, all Soldiers are going to need more than just the know-how to do their jobs. They're also going to need character -- to ensure they uphold Army values. During a television interview Sept. 9, at the Pentagon, Dr. Christine T. Altendorf, the new director of the Army Sexual Harassment/Assault Response and Prevention program office, or SHARP, said job know-how is not enough. 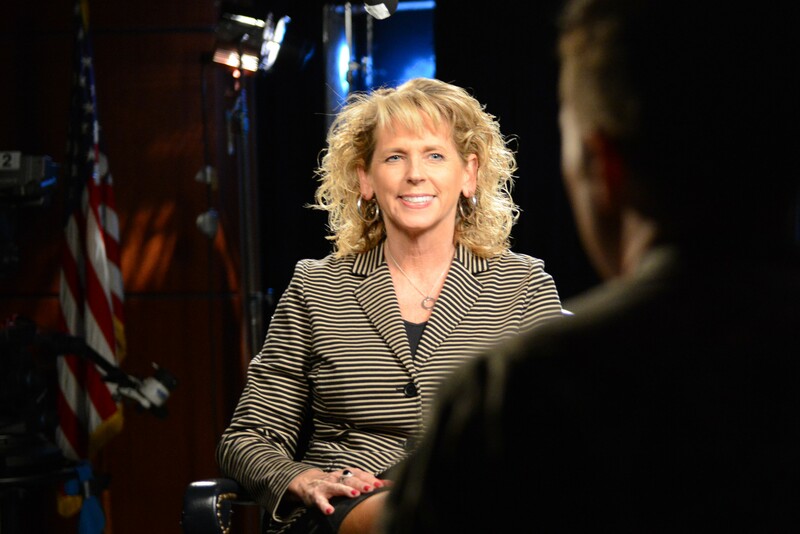 Dr. Christine T. Altendorf, the new director of the Army Sexual Harassment/Assault Response and Prevention program office, or SHARP, spoke Sept. 9, 2013, during a television interview at the Pentagon about efforts to curb sexual assault in the Army. "We need to really push forward that competence over character is not okay," Altendorf said. "You have to actually have the character. We have the Army values that are in place. We have to have our Soldiers abide by those values. And we have to have the utmost respect for our fellow Soldiers." Right now, she said, most Soldiers in the Army already have that respect for their fellow Soldiers. "The bulk of our Soldiers, and our service members absolutely are at the utmost respectful end," she said. "But we do get the bad apples that kind of taint our record when it comes to sexual assault and harassment." Maintaining that "record" is important, Altendorf said. Some of the biggest influencers for getting young Americans into the Army are parents. And if parents don't trust the Army, she said, the service may have a hard time convincing potential Soldiers to enlist. But right now, she said, she thinks the Army still has the trust of most Americans. "Can American citizens trust the Army as their sons and daughters are sent to us? I'm going to say, absolutely they can," she said. "They just have to understand the things we're doing, all of the initiatives that are in place, and how we are going to respond -- and also take care of victims." Altendorf said both commanders and their Soldiers have a role in changing Army culture in a way that can reduce the number of sexual assaults in the ranks. Senior Army leadership, she said has already embraced the importance of the Army's SHARP program, and what it is meant to accomplish. Leadership down the line must also embrace it in order for it to be successful, she said. "I think we have to make sure that the company commander and levels below have bought into this -- that it is not another check mark that they have to deal with [among the] multitude of other initiatives they are trying to deal with," Altendorf said. "We have to really focus this as a culture change. It isn't something we do for a couple of months and then it kind of goes away and then everybody has to focus on something different. This has to be a culture focus, and an initiative that really is bought into." Soldiers too are part of that culture change, she said; especially in the lowest ranks -- among E-1 through E-4 -- where most sexual assaults occur. "A huge impact is peer pressure," she said. "It's peer pressure in the positive or in the negative. And this goes back to the whole culture change. If somebody sees one of their buddies doing something that is not okay -- I think for the most part people do know when something is OK or not OK -- when they see that, they need to say this isn't the right thing, it isn't cool; and put that peer pressure on their buddies to do the right thing." Numbers for sexual assaults in the Army went up for the third quarter of 2013 as compared to last year. Altendorf said it will take some analysis of that data to determine why that is, but said she hopes it's due to improvements in command climate -- the kind of improvements that make a Soldier who has been sexually assaulted feel more comfortable actually reporting the crime. "I like to think it's an increase because we are presenting a trusting environment that people are willing to report," she said. The Army has at least two sets of numbers regarding sexual assault, Altendorf said. One is reporting data. That's when a Soldier who has been sexually assaulted actually reports that crime. The second set of numbers comes from survey data -- anonymous surveys that query Soldiers about both sexual assault and sexual harassment. "Reporting is under-reported," she said. "Based on survey data, a lot more folks have indicated they have been sexually harassed or assaulted compared to the number of reports." Altendorf said survey data -- believed to be a more accurate reflection of sexual assault numbers in the Army -- are called "prevalence of sexual assault." "Your goal is to get those two to come together -- have your reporting increase, while your prevalence goes down, and then, ultimately, have both of them go down together." On Sept. 9, Lt. Gen. Howard B. Bromberg, the Army's G-1, released a new SHARP guidebook to Army leadership. "The SHARP guidebook is a company-level reference tool for company commanders and Soldiers, Department of the Army civilians, and family members to use in sexual harassment and sexual assault prevention and response efforts," Bromberg wrote. The guide outlines the SHARP program, as well and prevention and response responsibilities for commanders, SHARP program personnel and Soldiers. The guide also includes a definition of sexual assault, resources for commanders and SHARP personnel.